If you look closely at the sign you'll notice that it's been rewritten. I wonder what the previous sign said. "Wait for Peter"? Seriously though, a Shunter is the person responsible for switching the tracks onto which approaching trains will be guided. The process is called "shunting", hence the title Shunter. 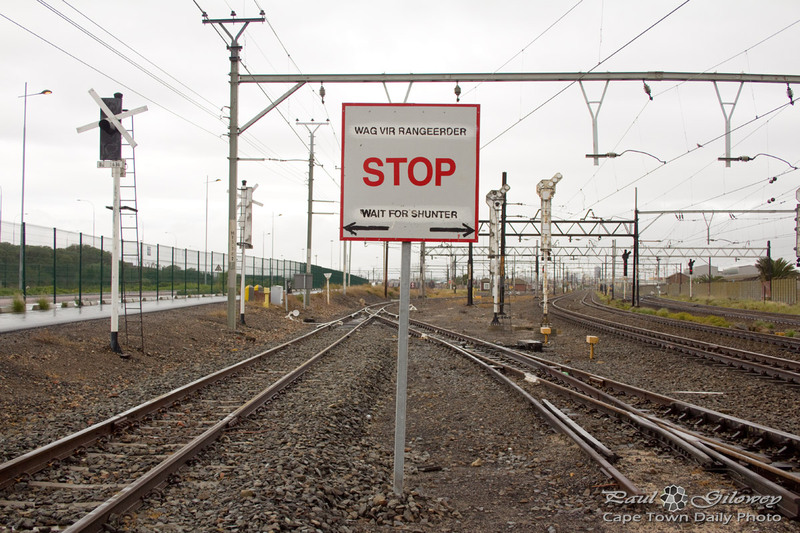 Posted in General and tagged railway on Saturday, 7 April, 2012 by Paul. I some times wish that Cape Town had an underground metro. Wouldn't it be great to catch the underground from the city center to Sea Point, then across the Waterfront and back to your apartment in Gardens? Thinking about the large amount of granite that we'd have to excavate and the huge amounts of ground water that we'd have to contend with I guess it would cost far too much money to build one, and our best bet would be a monorail (like one that we traveled on in Sydney). 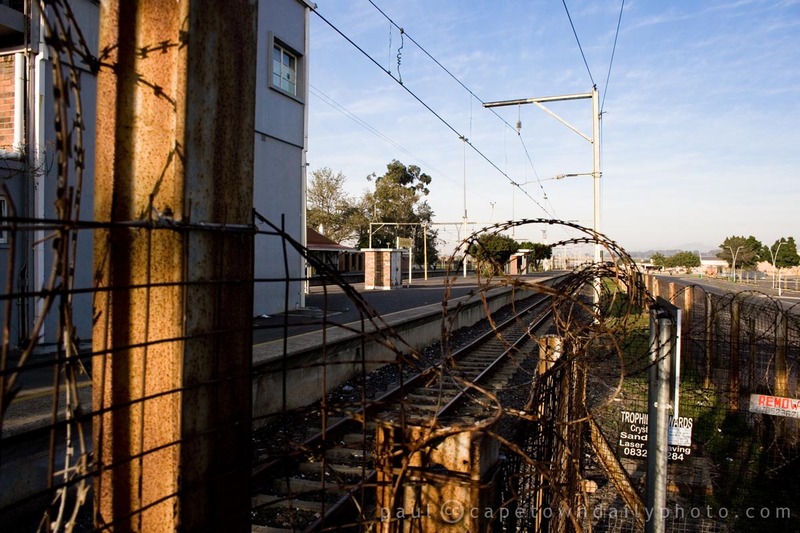 Posted in General and tagged fence, railway on Monday, 20 June, 2011 by Paul. I did say in my previous post that diesel trains pull many (many) coaches. Although the train whizzed past I swear that I'd have had enough time to finish a tall cup of coffee while it passed by. 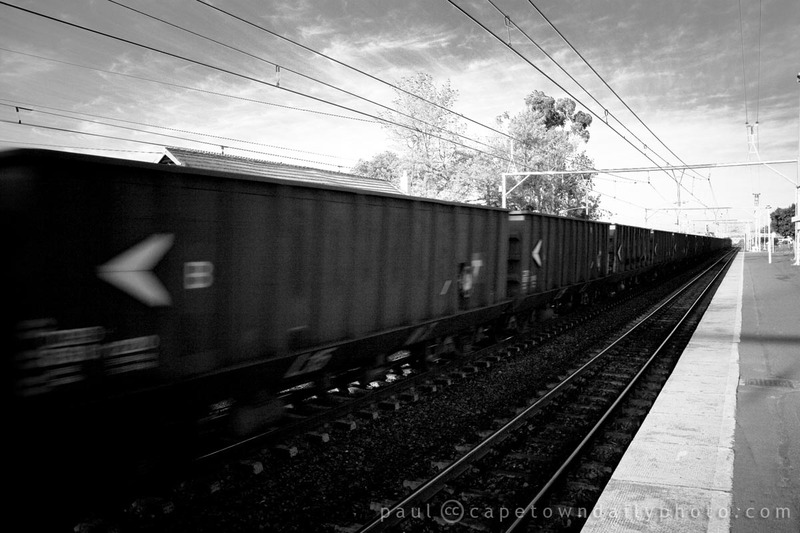 According to southafrica.co.za, 87% of freight is transported by road whereas the remainder is the small percentage transported by rail. The interesting thing is that rail transport is apparently between 30% and 50% cheaper than transport by road! I wonder why more people don't make use of rail transport. Could it be because not enough of the country is covered by heavy-duty railway lines, or could it be because of logistical problems with freight rail? Posted in General and tagged railway, train on Thursday, 19 August, 2010 by Paul. 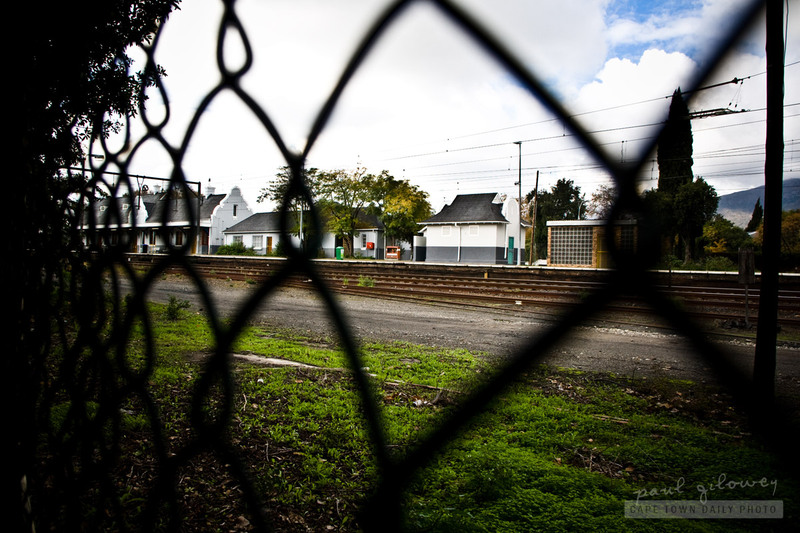 What you see here is one of the train stations along our Northern Suburbs rail route. For several years I'd find myself, early in the morning, taking a 20 minute walk to the station followed by a short (or sometimes long) wait on the platform and then the most monotonous 45 minute 25 kilometer ride to Cape Town station, with nothing more to look forward to than a 15 minute walk up to Cape Technikon and a day's worth of tinkering with computers and sitting in the most boring accounting and statistics lectures. To crown this all, once I completed my studies this continued as I started working for company in the Cape Town city center! Posted in General and tagged railway, station on Sunday, 15 August, 2010 by Paul.